A survey shows that the majority of white Europeans associate faces of black people with negative ideas. According to a study by Harvard's Project Implicit, based on scores for 288,076 white Europeans, collected between 2002 and 2015, most white people in European countries have an implicit racial bias towards black individuals. 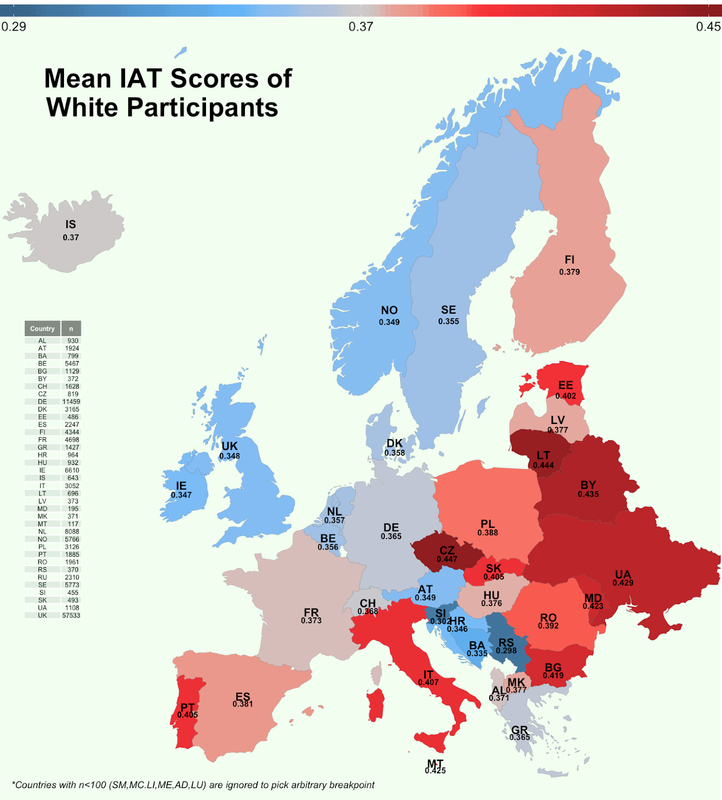 The above map illustrates the average Implicit Association Test (IAT) score for each country. The redder the colour, the more widespread is racial bias. The test shows that white Europeans are faster to associate Blackness with negative concepts such as "Bad" and "Evil", and slower to associate it with positive ideas such as "Good" and "Nice", revealing implicit attitudes and automatic associations in people's minds. Although the levels of racial bias vary across the continent, no European country received a score below zero, which indicates a positive attitude towards black people.